LYNNWOOD, Wash. (CBS/KIRO) A Washington state man said he came within seconds of having his car broken into, and perhaps stolen, until a real-life "superhero" came to his aid, wearing tights, a mask and a skin-tight super suit. The encounter started in Lynnwood Sunday evening when a man, who asked to be identified only as Dan, was walking back to his car in a parking lot when he saw a man with a metal strip trying to pry open his car, reports CBS affiliate KIRO. "He started sticking it down between the window and the rubber strip," said Dan. Dan began to call 911, but said help arrived before he even finished dialing. "From the right, this guy comes dashing in, wearing this skin-tight rubber, black and gold suit, and starts chasing him away," said Dan. What Dan didn't know is that just about every night, an anonymous Seattle man strolls into a comic store, enters a hidden back room and emerges transformed. KIRO reporter Monique Ming Laven met him. 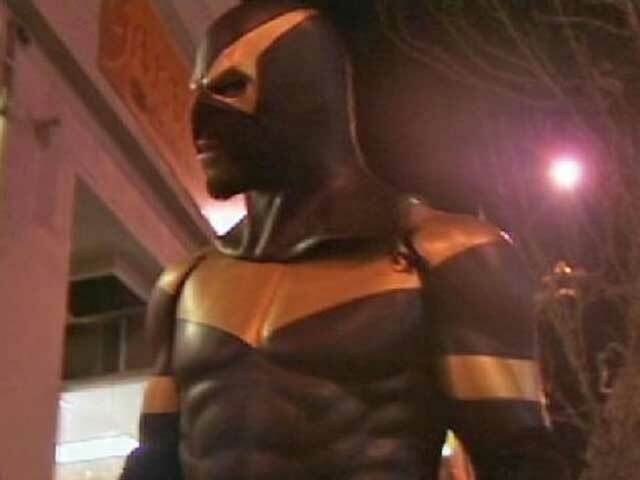 "My name is Phoenix Jones," said the man. The man is the hero Dan's been trying to tell his friends about. "People are saying, 'No way, dude, you were probably drunk,'" said Dan. But the superhero sounded familiar to Ming Laven. She had heard about how he and the other eight members of his Rain City Superhero crime fighting movement walk the street, eyes out for crime and prepared to fight it. On Monday night, the fully-clad superhero and Dan met. "That's crazy. Nice to meet you, brother. Nice to meet you. That's insane," said Dan, who finally got a close-up look at his savior. "Phoenix" explained his whole super suit, including bullet-proof vest and stab plates, to Dan. "That's a Taser night stick. And I have Mace slash tear gas over here," said Phoenix. Then it was time for Phoenix to get back out on the streets, maybe not quite a super man, but an extraordinary one. "So when I walk into a neighborhood, criminals leave because they see the suit," said Phoenix. "I symbolize that the average person doesn't have to walk around and see bad things and do nothing." Phoenix said since he started his crime-fighting crusade nine months ago, he's been stabbed, and had a gun pulled on him a few times, but received no serious injuries. Unfortunately, he didn't catch up with the man who was breaking into Dan's car.